Double Dragon may have kicked off the beat 'em up craze, but Capcom's Final Fight was the game that came out of nowhere and quickly became the measuring stick for the genre. So when Capcom had to cut the beloved cooperative play mode from the Super NES home version of the game, Japanese developer Jaleco decided that it would find a way to release a brawler that boasted that coveted gameplay mode and soak up some sales. While the co-op mode was a bit selling point for Rival Turfback in the early '90s, every other facet of the game ended up suffering greatly. Is the highly-touted co-op mode of this classic brawler still worth a look on the Wii U Virtual Console? That's what we're about to find out. For anyone that's ever played a brawler title, it won't take you long to jump in head first into this title. You'll be able to select from two characters (one of which we're pretty sure is a distant cousin of M. Bison) and then into the fray you'll be tossed. You're only goal is to beat your way through a bevy of enemies until you reach an end boss that must be dispatched. To say that they game borrows heavy from earlier beat 'em up titles would be a gross understatement. You have your main attack button that will automatically mix up your gameplay moves for you. Of course, getting in close will allow you to throw an opponent. If you're feeling particularly brave, you can even perform a nice jump kick if you find yourself in a pinch. One unique feature is the dash move which can be executed with a quick press of a shoulder button. While not overly effective as an offensive move, it can get you out of a pinch if the need arises. Also not to be overlooked is the special attack, which can be effective when you find yourself overwhelmed by enemies. The single player mode of the game can feel very redundant - especially when you take the repetitive nature of the action into account - but at least the game does include that thoroughly marketed co-op mode. You can tackle the game with another player, even going so far as being able to beat up your partner if the mood so strikes. There's also a VS. mode that will let the two of you go at it without any outside interference from other enemies and characters. It's certainly nowhere near on par with a true one-on-one fighting game like Street Fighter II, but can be good fun, if only to see who can push the action button the fastest. The hit detection is probably the game's biggest flaw as it sometimes feels like there's no sweet spot for attacking any one opponent. It can also be difficult to assess who is doing the grabbing when you're up close to an enemy - we lost count of the number of times we assumed we'd engaged the grapple but it actually turned out to be our opponent. It's little nuances like this that can make playing the game feel more like a chore than a source of enjoyment; Final Fight is notably free of such imperfections. Rival Turf blatantly attempts to clone the visual makeup of Final Fight. In all honesty it would be impossible to count the similarities. It might have been nice if the animation drawing and animation quality were the same, but Jaleco clearly had to make cuts in order to keep the game running on the Super NES with two characters playing at the same time - and the majority of those cuts were made in the graphical presentation. Characters are not only over-the-top silly looking, but they often feature only a few frames of animation in their various movements. The same can pretty much be said of the audio package; the music is forgettable and the sound effects don't have the same punch (pun not intended) as those in Final Fight. 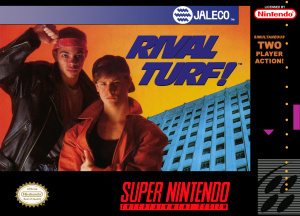 Rival Turf attempted to fill the gap left with the lack of co-op play in Capcom's Super Nintendo Final Fight release with its initial release, but it ended up sacrificing so many other facets of the game to do so that it left the overall experience feeling extremely flawed and unappealing. It would seem that sometimes you can become so obsessed with one feature that you forget that there are a lot of other areas of the game that have to be up to par in order to make the whole thing worthwhile. Rival Turf, sadly, wasn't able to do this in its heyday and certainly can't hold up on the Wii U Virtual Console - especially when you take into account all of the progress that has been made after its initial release. This brings back some memories. Perhaps better remembered than played again. The Cover picture just oozes the '90's. At the time we always went back to my Megadrive and Streets of rage. 90's, the time of cheesy clothing and street fighting. (Un? )fortunately I witnessed only the former. it looks so sluggish not that Final Fight on snes was butter smooth (certainly no streets of rage) For me one of the best ports of Final Fight is the GBA version. mostly because it has the alpha skins of guy and cody. Anyway I love me some pummeling from left to right. "Rival Turf" no literally I was walking by some projects ( short-cut ) and found this thing on the grass outside an window. I hate looking this game front cover. Two people who have just turned eleven ready to ruin their lives. It is sooooo terrible because nothing that is on the front cover of the US release has anything to do with the game asides the 1970's gang aspects. I really hate the way people make street gangs look bad. Street gangs were formed from the 1960's way of lifestyle similar to that of Charles Manson ( do not even start with the gruesome this and that because it was not his doing but the followers of him ). Basically people wanted to start their own civilization and not deal with the "man" rules. Eventually people started to realize they could make an living selling "stuff" to the rich and wealthy and formed similar communities. Even before this we had the biker gangs, and before that we had the original immigrant gangs. Even Elvis Presley was negatively affected by the gangs aspect. Point being is the fictional ideas of street gangs of the 1980's ( Commercial 80's ) is actually the former image of the civil-rights movement. People trying to make an peaceful living, while looking good. The negative image of stereotypes was created specifically to attack immigrants, to create an lower-class that was not productive enough to attain simple things like an house or car. I could go on with the subject but the reality is that street gangs culture created an backwards racism towards European ( white ) people that resulted in the INVISIBLE RED LINING we have today. Basically an non-European person ( especially an woman ) will not want to move into an area with European people fearing commercial ideas, along with people unable to get along or just have fun with each other. I just realized the character is the guy from Kung Fury! Oh, I remember this one. I rented it back in college. I remember thinking it wasn't terrible, just incredibly bland. @RegalSin Defending Charles Manson (who actually DID do quite a bit of gruesome stuff himself) and street gangs? Not good buddy, not good. Not to be rude, just a friendly tip: from the way you write your comments, you don't come across as a native English speaker. You seem to use the word "an" a lot, where it's not always supposed to be. Only if the word that comes next starts with a,e,i,o,u or y is it written as "an". Otherwise it is simply written as "a". "Eventually people started to realize they could make a living selling "stuff" to the rich and wealthy and formed similar communities." "People trying to make a peaceful living, while looking good." So, in short: a car, a man, a game and an opportunity, an article, an example. Hope it's useful. @gsmaciel Good call! I recently saw that on YouTube. 30 minutes of pure, cheesy fun. The sequel Brawl Bros is a better game. Its not great, but good, and a worthy addition to any fighting game library. I'm a Nintendo guy, but when it comes to 16-bit beat em all, Streets of Rage was the name of the game. I'll give that one to Sega hands down. For 8-bit, I'll take River City Ransom, that's my jam. I was wondering if the games were related, as I have the latter. Rough around the edges but not bad. Corbie's back! Seems like a while since I've read one of your articles. Jaleco wasn't really known for it's high quality games, and I agree with the score for Rival Turf, but for some reason I still love this game so damn much. They did Karnaaj Rally, which was awesome on the GBA. But that was developed by Paragon 5 and only published by Jaleco. Jaleco I think they made an couple of nice RPG games as well. good review. however corbs, just beating brawl brothers and rushing beat shura to freshly compare...i have to say rival turf was just as good in my book. kind of like how you say all the neo geo sengoku games are good. But, hey, are we talking about video games here, or socio-political issues? There is one hidden feature in this game that makes it a gem for me. There is a code you can put in to manually name every character in the game including the main characters and bosses. There is something really awesome about naming the weaker characters after people you don't like and naming the bosses after your best friends. Makes the game worth a playthrough. Thank god the Final Fight series is the only good beat em up series on SNES.